This is a quick travel guide oriented to budget travelers who want to travel to Barcelona and get the most out their visit, without having to break the bank. Whether you're traveling for business or pleasure, we provide comprehensive, insider tips. Rome is a city that needs to be walked in order to be truly experienced and understood. Every corner of Rome, every street, has something surprising and precious to reveal. The book invites you to approach the city on foot through nine walking tours. This book highlights free and less-expensive things to do in Dublin for the traveler on a budget. Step-by-step walking tours, maps, reviews of free and paid attractions, historical and humorous local stories, general travel advice are included. Rome is a city that has been in my heart the moment it started beating. I like walking through it, breathing in it and writing about it. Rome is a city where there are so many things to do and to explore, that you always keep finding new things. Contents: The period of modern art in Rome -- Social life in the Eternal city -- Day-dreams in Naples, Amalfi, and Capri -- A Page de Conti from Ischia -- Voices of St. Francis of Assisi -- The glory of a Venetian June -- The Magic land. English aristocrat Augustus J.C. Hare filled his days with trips to the Continent, and returned home to share his journeys with eager readers-and the journals of his travels still enjoy a cultishly devoted readership today. The south isles of Aran, which shelter the Galway bay from the heavy swell of the Atlantic, are Inishmore, the large island, nine miles in length; Inishmaan, middle island, two and a half miles in length; Inisheer, the lesser, two miles in length. This travel guide provides you with information about the sights and attractions in six cities in four countries, namely Reykjavik, Bergen, Oslo, Goteborg, Stockholm and Helsinki. Enjoy the architecture and the nature surrounding the cities. The finest selection of town, farm and country home accommodation on the island of Ireland. The Irish farmhouse and country experience is ideal for those who want to be immersed in rural landscapes and experience a more leisurely pace of life. Prague is one of Central Europe's most enchanting cities. The Vltava River winds through the many districts, that each hold unique architectural gems, impressive squares, lush oases and everything else you could hope for in a big city. Travel to Italy: trips to Milan, historical outline, Venice - a truly unique city, medieval towers of Bologna, Florence and the surrounding Tuscany, Rome - the Eternal City: the buildings of antique Rome, Piazza Navona, and much more. Hamburg is the second largest city of Germany. The city is one of Europe's major ports to the world. Commerce has for centuries taken place in the city, which today had enjoyable shopping streets and markets in the jovial German Style. Munich is the beautiful capital of the South German Federal State of Bavaria and the same time the gateway to the Alps. Munich is famous for its annual Oktober Fest celebrations. In this free travel guide you will find six tours to guide you around. Paris is the city of cities, the place where the romance rules and evokes memories or dreams in everyone. And there is really something to get on to. Paris has something to offer to everyone. There are first rate sights, fashion houses, parks, cafes. 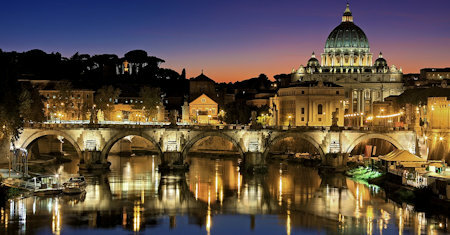 Rome is the Eternal City, to which tourists will come back again and again to make new discoveries. As the center of the Roman Empire, Rome's history is second to none and everywhere around the seven hills of Rome this becomes apparent. Barcelona is the capital of Catalonia and it combines many historical sites with the warm Mediterranean coast. Visit the impressive La Sagrada Familia made by Antonio Gaudi or relax in Barcelona's oldest park: Parc del Laberint d' Horta. A trip you will never forget, travel to Iceland and discover its capital Reykjavik. Best time to travel is summer when the sky doesn't turn dark. Rent a car and enjoy Island's magnificent nature, see the famous geysers, visit volcano Hekla. Discover Finland's capital Helsinki: in this fast growing city you will find beautiful architecture and many interesting sites. In this travel guide you will find two day tours and some suggestions for how to spend your time outside of Helsinki. Its location between the snow covered Alps Mountains and the Lake Geneva makes Geneva a wonderful scenic environment. This guide suggests several day tours and a number of locations outside Geneva along the sights and main attractions of this region. Know for the little Mermaid and the amusement park Tivoli, Copenhagen has much more to offer to its visitors. The medieval profile with its many towers and old buildings is unforgettable. This guide leads you along the main sights of Copenhagen. Edinburgh is the old and charming capital of Scotland. Enjoy the sandstone buildings, the exciting backyards in the old part and the breathtaking views from the hills outside of the city. You will find several tips to spend your time in Edinburg. Madrid is the beautiful capital of Spain. Here you will find many great and historical buildings, with the royal palace as an absolute highlight. Stroll down in the many small backstreets and enjoy the poetic atmosphere of this amazing city. The perfect offset for your journey to London, the centre of the British world. The city has been ranked among the leading cities of Europe for centuries, and cultures from all over the world have left their mark upon its streets.